Jack is babysitting for the summer on an isolated island with no Wi-Fi, no cell service, and no one else around but a housekeeper and two very peculiar children. He immediately senses something sinister-and it’s not just the creepy black house he’s living in. Soon he is feeling terribly isolated and alone, but then he discovers there are others. The problem is, he’s the only who can see them. As secrets are revealed and darker truths surface, Jack desperately struggles to maintain a grip on reality. He knows what he sees, and he isn’t crazy…Or is he? Where does reality end and insanity begin? The Turn of the Screw reinvented for modern-day teens, by National Book Award finalist Francine Prose. Why did I read this book: This is a contemporary retelling in epistolary format of The Turn of the Screw and it seemed like a good pick for this Halloween Week. 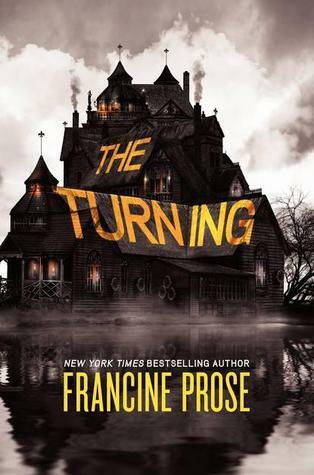 The Turning is a poorly-executed attempt at retelling Henry James’ The Turn of the Screw. Jack is a high school senior who needs to save money for college and as such, has accepted a summer position as a babysitter. He is to take care of two orphaned children, Miles and Flora, at the only house on an isolated island where the two children live with a housekeeper. Jack has been hired by the children’s uncle who does not want to not be bothered by any news about them. The uncle also doesn’t allow internet, TV or phone, in order to protect the children from the “corrupting influences of modern society and culture.” So Jack’s only means of communications with the outside world are his letters to his girlfriend Sophie and his father. Those letters are the narrative mode of this epistolary novel. The problem I had with the novel is twofold: the complications that stem from the contemporary setting; and the narrative itself. The problem with the former is how much suspension of disbelief is needed in order to buy into the premise. I understand that for this story to work there is got to be a sense of isolation in regards to the house and the children. This is already really hard to pull off in a contemporary setting but the choices made here on how to approach this were completely implausible. Basically, even though this is straightforward contemporary novel set in the modern USA, I am expected to accept and believe that in 2012, two children are brought up without any sort of modern amenities without any questioning whatsoever by those around them including the housekeeper, their teachers and gardeners? I am supposed to believe that in 2012, Jack’s loving and concerned father will just let him take this really weird job without ever questioning it? Not to mention that the premise does not hold in terms of internal logic either: the uncle does not want the children to be corrupted by modern society and culture (without any explanation as to WHY) and yet the boy still goes to school off-island where inevitably, he comes into contact with all those things . How does that make internal sense? Not to mention: how is a telephone a corrupting influence of modern society and culture? Of course, all of those choices are needed here so that Jack can write those letters. That brings me to the biggest flaw of The Turning: its narrative. First of all, Jack does not sound at all like a teenager. Bear in mind that this is a contemporary boy used to the Internet and text-speak and yet he writes these long, formal, polite letters to his teenage girlfriend. Am I supposed to believe that he would be writing those long letters, describing conversations word by word without swearing or using any slang whatsoever? Doesn’t Sophie know the name of her own father? This info-dump can only be for the benefit of the reader since it is information Sophie already knows as his girlfriend. The entirety of the first letter by the way, is Jack telling us Sophie again how he got the job. Seriously? Doesn’t Sophie know her own siblings? Needless to say, this drove me to distraction and I simply had to put the book down after about 150 pages (out of 243). Well that’s certainly disappointing, but yes, I can’t stand when there are elements that exist ONLY because it’s a must for the plot. And info dumps are the worst. The worst. Well, I actually know some religious people and other fanatics who don’t allow TV, internet and cell phones at home even though their kids go to normal schools and come into contact with such things. And there are some places, in the mountains for example, where there isn’t any reception for cell phones or internet to work or cable for normal phones. I just finished this one and I couldn’t agree with you more. Absolutely horrendous, and a complete butchering of The Turn of the Screw, which is wonderful. What annoyed me most, I think, was that Francine Prose seemed to equate writing for teens with writing for idiots. I actually read an essay of hers in class a few semesters ago where she argued that literature shouldn’t be taught in high schools because teens aren’t intelligent enough to appreciate its value. So then the real question is: why is this woman writing YA if she doesn’t understand the demographic? Anyway, excellent review. Wish I’d DNF-ed. The end definitely didn’t justify the means. I actually read an essay of hers in class a few semesters ago where she argued that literature shouldn’t be taught in high schools because teens aren’t intelligent enough to appreciate its value. I would be forever grateful if you could point me toward this essay and where I can find a copy please? Eh, either way you slice it, the essay itself is essentially an emotion-driven rampage against popular literature like Gatsby and Shakespeare. Ugh, I hated this book, sort of for the reason you moniten. I mean, god help me if I have to read another novel about a has-been/wannabe (male) English professor who sleeps with one of his (female) students and then (surprise!) pays for it. Yawn. Plus it really irritated me the way the guy in this book was the hapless victim the evil woman was deceitful and remorseless, using him up and spitting him out. Again, yawn. Im just saying but I finished this book yesterday and yes it caught my attention about half through it but I was lost and felt like an idiot trying to read this book. so I agree with all of yall about how this book is a disgrace to all readers because who would right a book that even an intelligent 18 year old in college with a bachelors degree would even get lost in it. Just saying.